You are at:Home»January»January 22»January 22, 1973: George Foreman is Famous for More Than Grills! January 22, 1973: George Foreman is Famous for More Than Grills! On January 22, 1973, heavyweight boxing legend and purveyor of home grills, George Foreman, pummeled the reigning heavyweight boxing champion, Smokin’ Joe Frazier, into a quivering pile of jelly in their championship bout in Kingston, Jamaica. The fight was mercifully stopped by the referee in the second round, making George Foreman Heavyweight Boxing Champion and de facto “King of the World.” As stunning as Foreman’s victory was, as Frazier was the undefeated Champion at the time, this fight was only one of 3 truly momentous fights in Foreman’s boxing career. Most boxers are lucky if they are involved in even one of boxing history’s great fights, and Foreman was involved in 3 such bouts, epic fights we will discuss today. Foreman knocked Frazier down a mind numbing 6 times within the first 2 rounds, with no “3 knockdown rule” in effect, before referee Arthur Mercante stopped the fight. Foreman had totally dominated the heretofore seemingly indestructible Frazier in a way a Heavyweight Champion has seldom been dominated. Foreman’s demeanor during this phase of his career was nothing like the genial Foreman Grill salesman we have come to know and love, as he had taken his cue from former Heavyweight Champ Sonny Liston and affected a sullen, glowering mien toward the press and the public. He seemed like a dangerous man, and he was! After dispatching a couple of contenders to his title, one in only 2 minutes and the second, another boxing legend and heavy hitter Ken Norton, in only 2 rounds, Foreman was scheduled to defend his crown against boxing legend Muhammad Ali in Zaire, the heart of Africa, in a highly hyped fight called “The Rumble in the Jungle.” Since Foreman had destroyed Norton, a boxer that had beaten Ali once and lost a second fight to Ali by a narrow margin, many boxing fans and “experts” expected Foreman to pound Ali like any other opponent foolish enough to fight Big George. They were wrong! Muhammad Ali was well prepared to face his fearsome foe and developed a strategy to allow Foreman to tire himself out while Ali protected his own face. Meanwhile, Foreman suffered a cut during training and the fight was postponed for a month. While recovering from the cut, Foreman’s training was disrupted as the healing cut needed to be protected, thus not allowing Foreman to properly spar in preparation for the bout. Boxing fans and bettors took no heed of the disruption to Foreman’s training regimen, and Big George remained a heavy favorite in the fight. On October 30, 1974, the big showdown finally took place, with Ali employing the now famous “Rope-a-Dope” tactic of covering up against the ropes while Foreman punched himself out trying to penetrate Ali’s defense. Ali lashed out occasionally at the frustrated and tiring Foreman, landing lightning punches to the big man’s face. Since Ali had started the fight quite aggressively, attacking Foreman with a display of speedy hands and feet, the change in tactics baffled Foreman and fight fans. The ropes containing the boxing ring were obviously looser than usual, causing later speculation that Ali’s camp had gotten the officials to relax the tension on the ropes to accommodate Ali’s tactics. As Foreman tired himself slugging Ali’s body and began to get wild, Ali would snake out lightning punches to Foreman’s head, until scoring a resounding knockdown in the 8th round, the first time George Foreman had ever been knocked down. The referee stopped the fight and George had lost the first bout of his professional boxing career, a fight remembered in Boxing History as one of Muhammad Ali’s greatest victories. Foreman went on to win his championship belt back when he beat Ron Lyle in 1976, for the vacant NABF title, and successfully defended that title against Joe Frazier, then sporting a record of 42 wins and only the 1 loss to Foreman, that same year. George went on to compile a stellar record of 69 wins and only 2 losses before fighting again for the Heavyweight Championship against Evander Holyfield at the normally considered over the hill age of 42. Holyfield beat the older Foreman, but Big George rebounded with 3 more wins before again losing a title fight in 1993, this time for the vacant WBO crown against Tommy Morrison. Undeterred by the loss to Morrison and his advancing age, Foreman again agreed to a Heavyweight Championship fight, this time against Michael Moorer for the WBA, IBF, and lineal titles. On November 5, 1994, at the incredible age of 45 years and 299 days, George Foreman stunned the boxing and sporting worlds by winning the Heavyweight Championship by knockout in the 10th round! Seldom has any athlete won any sort of major championship at that advanced age, and certainly no heavyweight boxer had ever won a crown anywhere near that age. Foreman, a heavy underdog, was getting beaten decisively through the first 9 rounds, the older man seeming slow and awkward in the ring. Then in the 10th round, Foreman scored with a vicious uppercut that split the Champ’s lip and sent him to the canvas. 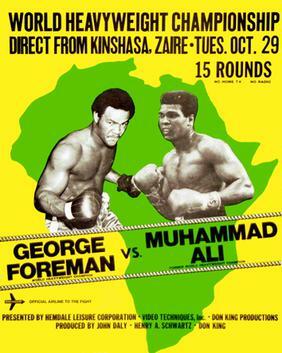 Foreman had won a “miracle” fight, the third time he had participated in one of heavyweight boxing’s greatest bouts. Other interesting facts about the miracle bout include Foreman winning back the title a whopping 20 years after first losing it, a span never matched. Plus, the age difference of over 19 years between challenger and champion in that match was the biggest age gap ever in a championship boxing match. Big George managed to win 3 defenses of his titles until losing the lineal crown to Shannon Briggs in 1997, just a few weeks short of his 48th birthday! Foreman’s fighting career ended that day, with the big guy posting a record of 76 wins against only 5 losses. His longevity at the top of his game is truly amazing, and his 3 most memorable fights are among the most famous in heavyweight boxing history. George Foreman has become a loved celebrity that frequently shows up on television and special events, including boxing matches, and has sold an incredible 100 million plus of his famous electric grills since 1994! A George Foreman Grill. Photograph by Popebrak at English Wikipedia. Questions for Students (and others): Are you familiar with George Foreman? Did you know the guy behind the famous grills was such an accomplished boxer? Have you seen any of the 3 big fights we discussed? Who is your favorite Heavyweight Boxing Champion? Foreman, George. By George: The Autobiography of George Foreman. Villard, 1995. Foreman, George and Kathryn Kellinger. George Foreman’s Indoor Grilling Made Easy: More Than 100 Simple, Healthy Ways to Feed Family and Friends. Simon & Schuster, 2004. McCoyd, Ed. To Live and Dream: The Incredible Story of George Foreman. New Street Publishing, 1997. The featured image in this article is of a sports event poster publicizing the Joe Frazier-George Foreman professional boxing match on January 22, 1973, and the copyright for it is most likely owned by either the publisher or the creator of the work depicted. It is believed that the use of scaled-down, low-resolution images of posters to provide critical commentary on the film, event, etc. in question or of the poster itself, not solely for illustration, qualifies as fair use under the copyright law of the United States. Previous ArticleToday is Martin Luther King Day…Too Bad the People on this List Have Not Lived Up to His Example! Next Article January 23, 1556: What Was the Worst Earthquake in History?